Greer says it’s stressful but also exhilarating that the entire NASA organization counts on each member to perform at an extremely high level in order to achieve its objectives. 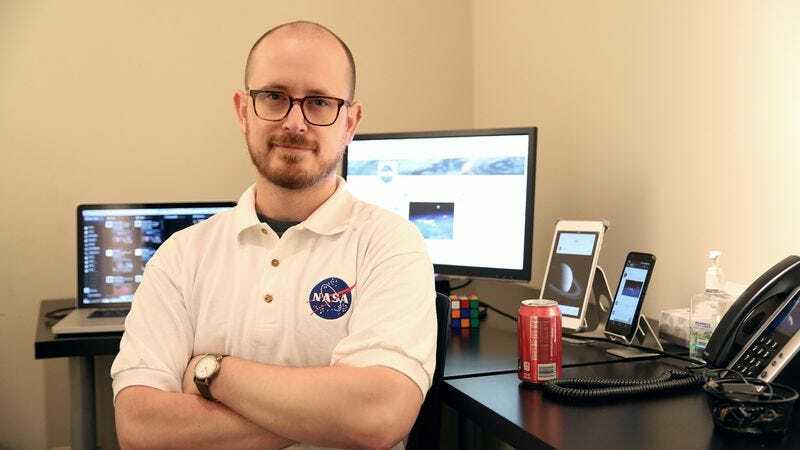 HOUSTON—Calling it a privilege to work in such a dynamic and collaborative environment, NASA social media manager Dustin Greer, 26, told reporters Wednesday he considers himself fortunate to be a part of the space agency’s team. Greer, who for the past four years has helped to maintain NASA’s official Twitter, Facebook, Snapchat, and Instagram accounts, is said to go about his job each day under the impression that, as social media manager, he is one of the thousands of men and women working tirelessly to advance humankind’s exploration of outer space. “We really are a well-oiled machine,” he continued. Citing the New Horizons probe’s Pluto flyby and the Curiosity rover’s landing on Mars as examples, Greer told reporters it was hard not to take immense pride in the landmark achievements he and his colleagues have made since he was first hired to run NASA’s social media presence. Greer, who majored in communications at DePaul University and joined NASA after a summer marketing internship with the e-commerce site Groupon, added that behind the agency’s awe-inspiring feats are countless long days and sleepless nights that most Americans never see. The employee tasked with curating the agency’s LinkedIn page was also quick to point out that at NASA, he and his fellow staff members are always expected to place the mission ahead of their own personal egos. Greer stressed that whether they are gathering data from space telescopes, devising next-generation technologies to enable extraplanetary habitation, or repromoting posts from the agency’s Tumblr account, neither he nor his coworkers are concerned with claiming individual credit for their contributions. Furthermore, Greer said, he and the agency’s engineers, physicists, and crewmembers were essentially one large family. While stating that he thoroughly enjoys his work, Greer admitted to reporters that with so much at stake in their day-to-day operations, he, like everyone at NASA, tends to place an enormous amount of pressure on himself to avoid letting down his colleagues. The man responsible for posting clips of NASA press conferences to YouTube went on to say that when he is feeling burnt out from the demands of the job, he needs only to remind himself of the millions of young Americans who NASA is inspiring every single day.